Studio 5380: Halloween Test Tube Treats! The test tubes are filled with "eyeball chewing gum"...yummy! Those are so coo, love how they turned out. Have a great day! These are so AWESOME!! What an adorable set of treats!! Thanks for sharing and for your amazing inspiration! Have a GREAT hump day my friend! 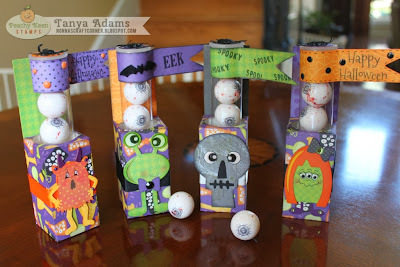 Too cute, love the eyeball test tubes!! These are so cute!! Love all the different little monsters! Super DUPER cute & FUN!!! 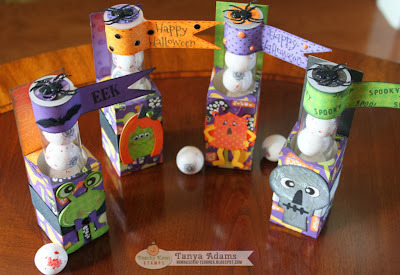 Eeeek, these are adorable Tanya! I love the way you did the top with the sentiments! The little monsters are awesome! Cute, cute! You are such an inspiration!!! :) I am always so happy to see your updates via my email! Your projects are always so cute and so very detailed...love them!!!!!! Candy guarded by spiders, how spooky. These re adorable. Love the monsters. These are wonderful! Great monsters! TFS and Happy Halloween. Love them!!! I'm sure the little ones will just love that!! Super fun halloween treats Tanya, love the bright colors!! Just too cute. Love them. Tanya ~ LOVE the test tubes!! The details are seriously INCREDIBLE and the eyeball candy is so darn PERFECT too!